If you’re playing the Shadows of Mirkwood series of adventure packs in order, A Journey to Rhosgobel is the third stage, coming after the brutal Conflict at the Carrock. The story has our heroes encounter a wounded eagle, which needs taking to see Radagast at Rhosgobel to be treated with the medicinal herb Athelas before it is too late. The second adventure pack to feature an ally in the enemy deck, A Journey to Rhosgobel revolves around the eagle character Wilyador, who unlike Grimbeorn from Conflict at the Carrock, joins the players immediately and swaps ownership each turn. With 20 hit points he certainly seems a tough cookie, but he also weakens at the end of every round, a nice mechanic which puts pressure on the players and forces them to attempt to complete the quest quickly, rather than hanging back and building up their forces. There are relatively few new enemies in this set, but a handful of dangerous Treachery cards which can have devastating effects. This scenario is definitely a breath of fresh air, with a very specific mission which thematically fits rather nicely. Nevertheless it is still a bit of a mixed bag. The most common complaint is that this mission is, moreso than normal, extremely dependent on the luck of the draw. Healing Wilyador essentially relies on finding Athelas cards mixed in the enemy deck. Whilst there are a few locations which can help, the proportion of these cards is still very small. I haven’t played it solo, but I can imagine that only drawing one card from the deck would make it even more difficult. The scenario has a difficulty rating of 6, which puts it marginally easier than Dol Guldur and Conflict at the Carrock, but I would argue that the rating depends entirely on how the cards fall. A good shuffle, and you can find all the healing cards you need for Wilyador in the first few rounds; a bad shuffle, and he’ll die long before you find a single one, and there’s virtually nothing you can do about it. In terms of the player cards, this set offers a fairly decent selection. The hero in this pack is Prince Imharil (Leadership), a character very similar to Aragon both in terms of stats and ability, and overall a useful alternative, if perhaps fairly bland. There’s no song in this pack, rather a neutral ally, Radagast, who collects his own resources which can be spent on bringing creature allies into the game, or healing ones already there. 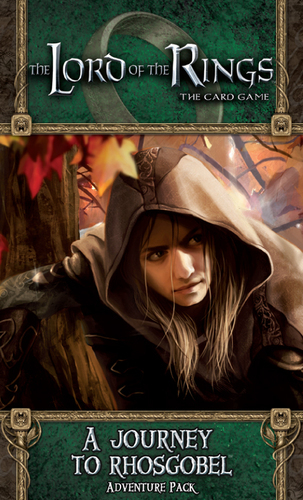 If you’ve been playing these adventures in sequence, there are also a few more cards here which will make some of the earlier inclusions more useful, such as the two cards which allow you to look through the top X cards in your deck for an eagle or Rohan card from The Hunt for Gollum adventure pack. Overall this is a decent expansion pack, which adds some useful cards to the player decks, and offers a unique adventure with some nice mechanics that add tension, and force the players to consider their moves carefully. Unfortunately, it’s rather more luck-dependent than previous adventures, and could probably have had more playtesting and a little tweaking to hit the note. This is one of those adventures where players will find themselves honing a deck specifically to the case in hand, and may even then still fail because they cannot find an Athelas card, or too many Treachery cards appear in a bunch. If the luck of the draw is one of the things that put you off this Lord of the Rings card game, it might be worth skipping over this particular pack. In America, anybody can be president. That’s one of the risks you take.